Not only is it dangerous, climbing Mount Everest is not cheap, either in terms of lives or dollars. And yet, hundreds are drawn each year to climb it. Commercial expeditions can cost climbers $60,000 to $75,000 each. Nepalese government charges fees ranging from $25000 for one member expedition to $70,000 for seven members. The total cost for climbing is steep, according to CNN. An expedition to the world's second highest peak, K2 in Pakistan, runs around $50,000 per climber. A trip to Everest has the steepest price at $65,000. Individual climbers can easily spend $5,000 on equipment. The total Mt. Everest annual revenue runs into tens of millions of dollars and provides employment to several thousand people. 3,681 people have made the summit so far, but thousands more have tried. About 170 climbers have died in their attempts to reach the summit. Launched with a distinct vision of promoting the tourism culture in the country, www.pakistan-explorer.com is no less than a breath of fresh air, striving to do justice with the huge bounty of natural wonders and resources the country possess. Tourism in Pakistan with all its natural wonders and all the grand peaks that the country holds in her lap, is still grossly underrated and unexplored even by the local masses within the country let alone the foreign community. natural beauty the country has been sitting over in all this time. www.pakistan-explorer.com is determined to help the third generation of Pakistan to break through this blinding oblivion which has kept them from exploring their own neighbourhood since long. their nationalities and access to the same. The team insists that the portal is one of its kinds and while they are hoping to revive the dilapidated tourism industry in the country, they will continue their attempts to bridge gaps between the neighbours in the volatile region. the most difficult and deadliest to climb on. capital of Gilgit-Baltistan, is another serene place in the country and is apparently more of a valley between these giant mountains. www.pakistan-explorer.com brings latest updates on the expeditions underway in the deadly Karakorum and the Himalayas. The website also provides excellent features on the success and attempts of teams and their past record in sport of High Altitude Mountaineering. The portal covers the scenic and archeological assets of the country, giving valuable insights about their present condition and past history. Pakistan is in the grip of ‘summit fever’ as three different expeditions — K2, Broad Peak and Gasherbrum 2 (G2) — all along the Karakoram Range, have taken place this year. News about the summits — K2, Broad Peak and G2 — started jamming mailboxes and blogs on the morning of July 31, 2012. According to the Alpine Club Pakistan (ACP), 20 members of the international Seven Summit Treks took the Abruzzi Ridge on K2, standing like a perfect pyramid 8, 611 metres, in the early hours of July 31 to conquer the second highest peak in the world. Although the ACP has yet to confirm, if it was 20 or 23 members who pushed for the summit. Nonetheless, the mountaineering community was proud to share that this was one of the biggest group to reach the top of K2. Ten Sherpas from Nepal, three Chinese, Azim Gheychisaz from Iran, Fabrice Imparto from France and Turkish Tunc Findik are said to be among those who reached the summit in a group led by Chhang Dawa Sherpa of the Seven Summit Treks. ACP said this was an incredible feat on K2 from the Pakistan side, since the last three years. 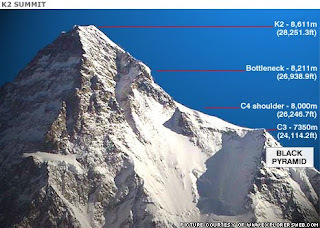 Few more from other teams were also said to have reached the summit but their names were not available putting the total number to 23, ever to have reached K2 in a single day, the ACP elaborated. mountain. Several Sherpas lost their lives attempting to rescue the trapped climbers around the elusive ‘bottleneck’ that is famous for ice avalanches high on the Abruzzi Ridge. Mingma Sherpa was the first Nepalese to have climbed all 14, eight thousand metre peaks in the world. While supporting his elder brother and chasing his own dreams, Chhang Dawa Sherpa also crowned 12 of these peaks. Dawa led this large international team to achieve his last Karakoram peak and reached the top of K2 at around 10:55am, followed by his colleagues. ACP said that Dawa spoke from the summit and gave the brief details of their success to Nazir Sabir’s expedition office, which was handling the team in Pakistan. “He was ecstatic about this achievement and informed many of the team members returning to Camp IV, while others were descending,” said an official in ACP. While most climbers reached the top with oxygen tanks, Polish Adam Bielecki and Persian Azim Ghaychesaz reportedly topped out without O2. And climbers from Spain, according to ACP topped out the 13th highest mountain in the world, G2, standing at 8,035 metres. Managing Director Pakistan Tourism Development Corporation (PTDC) Mir Shahjahan Khetran on Friday said that one million foreigner tourists visited Pakistan in current year. He said that law and order situation in Pakistan is much better which is attracting international tourists. He stated this while addressing the Tourism Walk participants at Margalla Trail-5. PTDC organised the walk to create awareness among youth about importance of natural environment and tourism. Shahjahan Khetran said that PTDC is going to construct more trails in capital in co-operation with Capital Development Authority (CDA). He said PTDC in collaboration with non governmental organisations initiated a number of tourism projects in different areas including Khunjerab, Chitral, Chouperson Valley, Dir Kohistan, Hussaini, Gilgit and Shimshal Valley. He said that PTDC in collaboration with Alpine Club, Adventure Foundation and Sustainable Tourism Foundation organises different programmes for students in Kashmir, Kaghan Valley and Gilgit Balitistan to create awareness about preservation of environment. Students are trained about cleaning of mountain, safety of flora and fauna in these areas, he said. He appealed the Prime Minister to retain PTDC under federation in order to develop and promote tourism in the country and abroad. Around 150 students from various schools, colleges and families from twin cities of Islamabad and Rawalpindi participated in the event. Certificates and shields were also distributed among participants of walk. ISLAMABAD: Pakistani skiers clinched two top positions at a skiing competition called Dream Programme – 2013 held in Gangwon Province, the Republic of Korea, said a press release on Monday. President Ski Federation of Pakistan (SFP) Air Marshal Farhat Hussain Khan congratulated Noor Muhammad and Shah Hussain of Naltar Ski School who won the gold and silver medals respectively at the event. He hoped that the success would significantly boost the SFP’s ventures in national and international ski events. The winning skiers also met with the Korean Ambassador to Pakistan Choong-joo Choi who appreciated the performances of the budding players. The Dream Programme was initiated by Gangwon Province in 2004 to promote winter sports in countries where winter sports facilities were not fully developed. Pakistan joined the programme in 2011. This year, around 150 participants from 40 countries took part in the training after which athletes were divided into groups and competitions were held among them. From his vantage point in the air, Antoine Girard soared nearly level with the summits of Pakistan's jagged snowcapped mountains: K2, Broad Peak, and G4. The French athlete wasn't flying in a commercial aircraft, though. He was bundled up like a mountaineer in a snowstorm, breathing oxygen from a tank, and cruising along in his paraglider, reports Planetmountain.com. This was no mere jaunt. Girard's surreal flight in Pakistan lasted for seven hours. He started over the long Baltoro Glacier, then headed over the famous rocky Trango Tower to the Concordia confluence before he caught the right thermals to fly over Broad Peak on July 23, Planetmountain.com reported. Reaching a height of 26,761 feet, Girard made history by becoming the first person to surpass the 8,000-meter (26,246.72 feet) mark for high-altitude cross-country paragliding. The Adidas-sponsored paraglider, who is also an experienced mountain climber, spent weeks in Pakistan preparing. "This is the flight of the century," American adventure pilot Brad Sander, who assisted Girard in Pakistan, told Cross Country magazine. "It's beyond anything anyone has done so far." Girard manages makes the feat look downright relaxing, but paragliding comes with crazy risks. Earlier this week, paraglider Damien LeRoy's engine stalled right before a turn in Florida, prompting him to bail 150 feet above the ground to avoid crashing. The fall broke his back, femur, pelvis, three ribs, and punctured his lung, ABC News reported. Fortunately, he survived to tell the tale. Just watching paragliders from the ground here in Colorado, I get nervous that a sudden gust of wind would send them careering into the mountainside. Girard's footage, on the other hand, is far more relaxing to view -- as long as you don't think about how cold his fingers must have gotten.